We will be learning the art of using pastel painting materials which include soft pastels and oil pastels. Discover the variety of creative ways you can use pastels in both dry and soluble form which gives you a broad range of styles to work in. During the morning students will learn how to draw with soft pastels through demonstrations and exercises. Students will discover how to blend, layer, and use as a dry medium and blended with water to create versatile effects. This will be followed by a creative project designed to give students the opportunity to experiment and develop their skills in drawing with soft or chalk pastels. Students will be supported with lots of 1:1 tuition as well as group critiques. 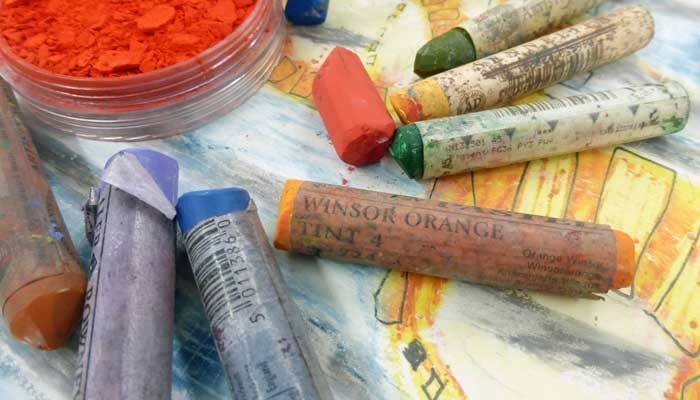 The afternoon session will involve a further creative project drawing with soft pastels allowing students to develop further skills in using colour relationships and the background paper colours to full effect within their drawings. Day 2 begins with a demonstration of how to draw with oil pastels. After a short exercise students will complete creative project allowing them time to experiment and explore with 1:1 support and guidance. In the afternoon students will be given a second creative project allowing them the freedom to fully exploit oil pastels, dramatic colours and versatility in mark-making, creating textures and developing a painterly feel to their drawings.